2017 is fast approaching, and I'm afraid. I think what scares me most about the New Year is this: what if nothing is new? This year has not been easy. I've felt grateful for unrelenting friendships, community brunches, tropical parties, the Scottish countryside, the richness of India, countless beautiful sunsets and undeserved opportunities to talk about Jesus. But it's also been a year where sadness has often been too heavy to bear. My health, my work, my character has buckled beneath its burden. And with each year that passes, familiar loads seem heavier; it matters more that I'm getting older, that I'm overweight, that I'm single, that I'm childless, that I'm so intense, that I'm XYZ when I'd hoped to be ABC. Each year ends and it feels worse; I look to the New Year and I'm afraid: what if nothing changes? What if, though the year is new, nothing else is? 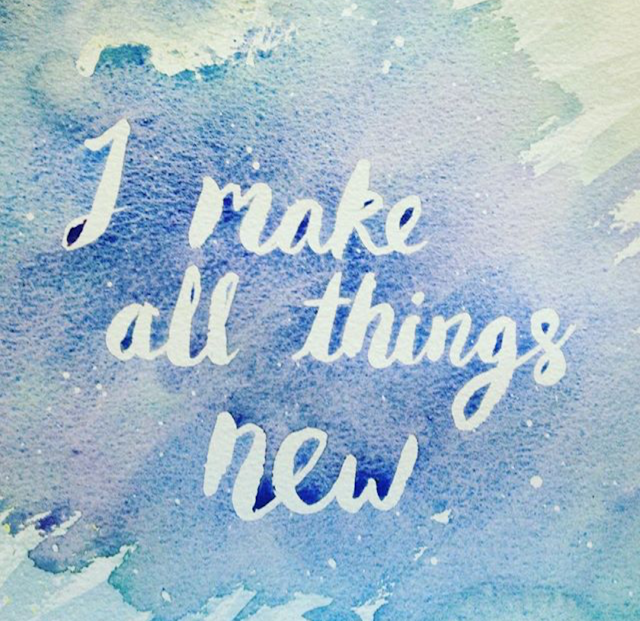 But in to my fear, Jesus speaks and says: I make all things new. The first man was asked to keep the Earth and cultivate it, to dig and farm and tend it in to something fruitful and productive and rich. But he failed. Adam's legacy and pattern is not one of restoration or revival or life. His world is in tatters. This planet is orbiting its way to disintegration and oblivion, and all its inhabitants feel the choke of the thorns and the frequent triumph of the weeds and the arid, heartless, unrelenting sting of death. We look to the future and the only certainty we know is death. Far as the curse is found." I love these words. How far do his blessings reach? As far as the curse does, at least. Jesus, the new Adam, the ultimate Gardener, is making everything new. He is at work in the garden; he comes to restore. And the Biblical pattern for restoration is generous and glorious (scroll to the bottom of the post for a few examples): You will be restored double, you will be brought up from the depths of the earth, your greatness will increase, you will have everlasting joy!" The promise that runs through Scripture is that there will be restoration. All of the sadnesses and inevitabilities of life in Adam's death-ridden garden will be redeemed, revived, rejuvinated. Where death has reigned, life will! The years the swarming locusts have eaten will be restored to us; our shame will be taken away, our suffering will be replaced by glory...! But how do we know? What reason is there to dare to hope that any of these promises might be true? I struggle with this immensely when I look back at some of the disappointments I've felt and the recurrence of sin and despair... I cannot for the life of me fathom where redemption could possibly be happening! I think, as ever, my reason for confidence is Jesus. Not only is He the Gardener of the new creation, He's the firstfruits of it too. Jesus is alive. He's the firstborn of creation; he's the guarantee that the broken world is being bound up and put right; He's the evidence that all things are being made new. When Mary was weeping in the garden, and thought she was talking to the gardener: she was! Jesus, the new and better Adam, the God Man who comes to make a world that's vibrant and fruitful and bountiful. But she was also seeing, in the flesh, a concrete, physical reason to hope that all things were being made new- the first fruits of those who have died. I find it hard to look forward to the New Year in very many ways. It can feel utterly discouraging because I feel like I'm still just a daughter of Adam, living in Adam's garden: I feel like I'm cursed, the ground is hard, work feels futile, and death seems inevitable. I'm absolutely convinced that I bear the image of the man of dust. In the same way that I've in every way shared in the dustiness of Adam, I will share in the heavenliness of Jesus! I am comforted by the Risen Jesus, who gives me reason to hope that there will be new things in the new year. In the new year, the kingdom of heaven will grow quietly. There will be new mercies for new mornings. Brokenness will be restored in the Messiah's healing. And day by day by day, we get closer to a new heavens and a new earth, and a beaming Gardener, whose hands are messy from his toil but whose heart is full for the joy he's accomplished, welcoming us to a world where everything is restored, and all things are made new. You who have made me see many troubles and calamities will revive me again; from the depths of the earth you will bring me up again. You will increase my greatness and comfort me again. Return to your stronghold, O prisoners of hope; today I declare that I will restore to you double. Instead of your shame there shall be a double portion; instead of dishonor they shall rejoice in their lot; therefore in their land they shall possess a double portion; they shall have everlasting joy. I will restore to you the years that the swarming locust has eaten, the hopper, the destroyer, and the cutter, my great army, which I sent among you. “You shall eat in plenty and be satisfied, and praise the name of the Lord your God, who has dealt wondrously with you. And my people shall never again be put to shame.